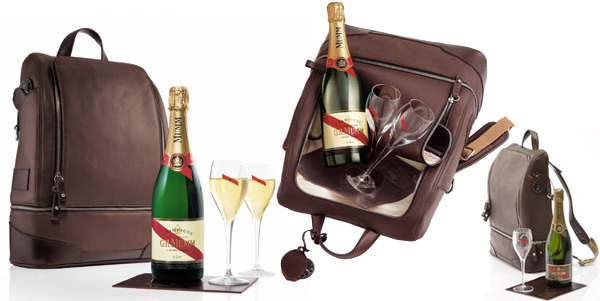 Mumm suddenly has me antsy to go on an expedition… Mumm Expedition Kit: “An echo of the leather knapsacks used by 19th century explorers in Africa, the kit consists of a stylishly simple bag in brown leather. The bag’s lower half forms an insulated compartment to keep your bottle of G.H. Mumm champagne cool for up to 12 hours. You’ll also find a small, brown leather tray and two unbreakable flutes in the bag, ensuring refreshment is always at hand, whatever the location. 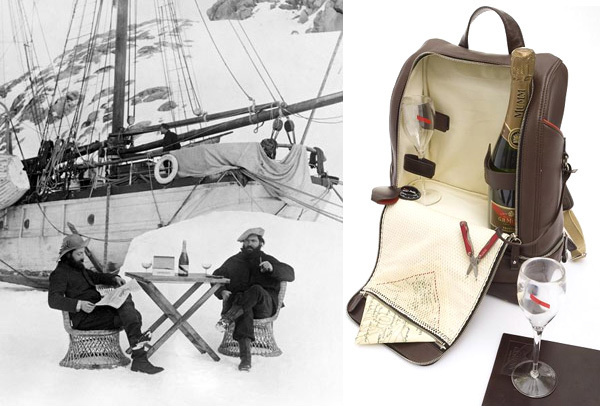 The kit includes other explorer essentials, such as a compass and a map of the Reims area printed on silk.” Mmmm, champagne, a compass, and a silk map encased in leather… quite the expedition, no? It’s nice to know that the beginning of colonization and the enslavement of W. Africans still provides inspiration to douchebags.